I had some peaches that were going a bit soft and decided to use them up in a dessert. I thought peach would go well with ginger - which is the ingredient for this month's Feel Good Food Challenge, and begins with G which is ideal for Alphabakes! I decided to see what ideas Google could suggest using both peaches and ginger, and found this recipe for a ginger peach crisp - which turned out to be a lot like a crumble, and very nice! Preheat the oven to 180C. First make the crumble topping, by rubbing the butter into the flour until you have a breadcrumb-like consistency. Then mix in both the granulated and the brown sugar and stir in the almonds. Slice peaches and place in the bottom of an overproof dish. Sprinkle over the sweetener and the ginger. Spoon the crumble topping over the top. I love crumble - and the ginger and peach made this a nice change from the apple crumble I would normally make. It's lovely served with cream or ice cream, or if you don't have either, even just a splash of milk. I'm sending this to Feel Good Food. hosted by Victoria of A Kick at the Pantry Door. I'm also sending this to Alphabakes, managed this month by my co-host Ros of The More Than Occasional Baker, as our letter this month is G.
I'm also entering this in the No Waste Food Challenge, which encourages us to use up leftovers - the peaches were getting soft and needed using up, and the flaked almonds came from an open packet in my cupboard that has been there for quite a while! 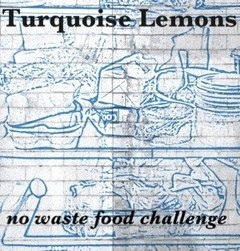 The challenge is hosted this month by Elizabeth's Kitchen Diary on behalf of Kate from Turquoise Lemons. unusual combination , but should be nice . mmm sounds delightful! wouldn't have thought to pair peaches and ginger, but now you've said it it makes perfect sense! Thanks for linking up with Feel Good Food!